This entry was posted in Architectural History, Heritage at Risk, Irish Town, Tipperary and tagged Architectural History, County Tipperary, Fethard, Heritage at Risk, Irish Town. How very dispiriting. Surely someone can step forward to save this place? Nothing appears to have been done since the above photo was taken except for some strange reason the windows have now been divided into panels , which is probably what they were origionallly . 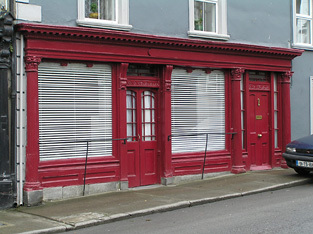 There is no easy solution here as the shop windows are completely impractical for what is now a private house .The shopfront could be restored and removed to a new location but as this is a listed building the council cannot allow any change . So we will have the usual standoff where nothing will be done and the decay will accelerate to a point where it becomes completely impractical to repair or restore . We were very proud of this beautiful shop front and now so very very sad.